Donald Trump is roaring his disapproval of General Motors' decision to shutter US manufacturing plants and says he will retaliate. Energy industry leaders met in Houston last week for the CERA Week conference. Almost to a man (there were virtually no women on the stage) they saw nothing but bright skies ahead for fossil fuels and expressed little concern about electric vehicles. Where do I get a job like that? 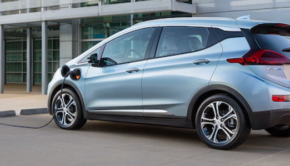 Mary Barra, CEO of General Motors, went to the CERA conference in Houston this week to push for more industry cooperation on electric car charging infrastructure, uniform vehicle emissions standards, and support for renewable energy. Good on ya, Mary! It's hard to tell exactly what GM CEO Mary Barra actually intends with regard to Chevy Bolt EV sales. Is GM actually trying to sell the model in high numbers? If that's the case, then why is advertising non-existent, and why aren't dealers pushing the models? Although Tesla finished the year with record sales, it's gotten off to a slow start with the Model 3. With a 455,000-person wait list, a lengthy wait lies ahead for plenty of Model 3 reservation holders. Automotive News reports, "That leaves an opening for other EV makers, such as Chevy, to woo away Tesla customers. But it's not an opening Chevy plans on openly exploiting, the company said." GM's CEO, Mary Barra, tells the press that her company will basically split into two separate divisions -- one building electric cars for the world market in China, the other manufacturing trucks and SUVs in America. What Changed In The EV Battery Market In November? 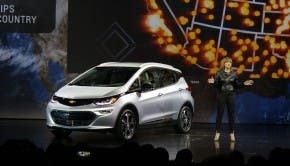 General Motors says it will have two new electric cars on sale in 18 months and 20 models in its lineup by 2023, plus a fuel cell powered truck chassis. 1st Chevy Bolt Deliveries Have Begun In California!